I am so excited about today's post! wanted to share a little bit more about it and how I got involved! 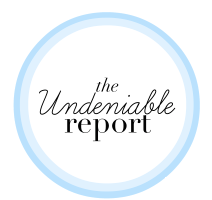 The Undeniable Report is 'a lifestyle website created for girls that will be your destination for everything you need or care to know about on topics like style, beauty, wellness, business, travel and more.' Each written by girls ranging from their teens to their twenties, the articles are unique, witty, and genuinely fun to read! Anna Tselevich, the founder and editor in chief (she did my blog makeover), wanted to form a group of talented blogger to create something new and amazing! The Undeniable Report started as an online magazine but has now grown into its own website! Anna contancted me months ago asking if I wanted to be a part of this growing community and of course I said yes! I am the column leader for the 'Culture' category, where you'll find articles about music, movies, tv, celebrities, diy's, and much more (feel free to check out my article)! I get to work with other talented bloggers and writers in coming up with article ideas, scheduling posts, and making sure the column has new content! Since the start of the Undeniable Report, I have gotten to know so many amazing girls! Each one, whether she's a writer, editor, column leader, or photographer, is so unique and brings something new to the group! Not to mention, we have a pretty amazing group chat going on:) I am so blessed to be able to work with these amazing girls and I can't wait to see where Undeniable is headed! Check out the Undeniable Report and leave a comment about what you think! Such an exciting project!! It's a beautiful site - I can't wait to see what is to come! It's been so much fun working with all the girls who are part of Undeniable and I'm so glad you love the site! If you're interested in writing/being a part of the team you should email me!